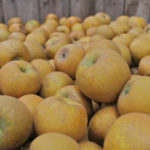 Every year at the Natural Grocery Company we bring in different types of organic, local heirloom and biodynamic apples, most of which we get from The Apple Farm in Philo, CA and Filigreen Farms in Booneville, CA. At the peak of the season we may have more than 50 different types of apples available at our El Cerrito store, with more varieties to come as the season changes. 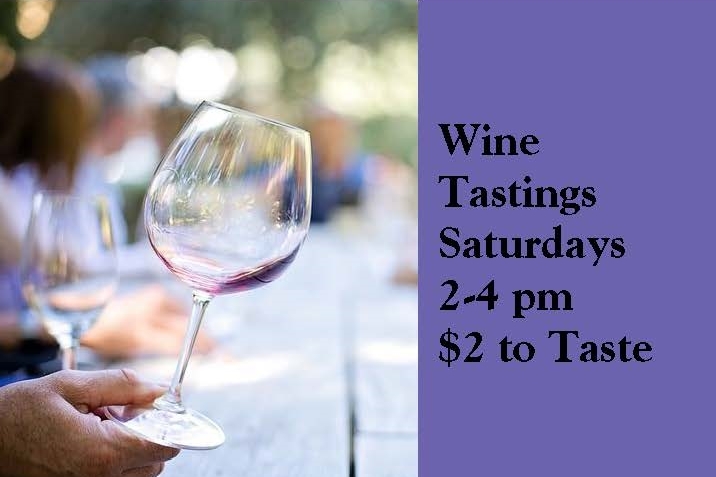 Right now we have 44 varieties at El Cerrito Natural Grocery Co. From The Apple Farms’ Ashmead’s Kernal, Roxbury Russet and Belle De Boskoops to Filigreen Farm’s Kidds Orange Red, Red Gravenstein and Pink Sparkle. With all of these apples in abundance one might ask, what makes these two farms and their apples so special? They are both certified Biodynamic, a method of organic farming originally developed by Rudolf Steiner that is described as a holistic understanding of agricultural processes. This type of farming has an astrological sowing and planting calendar. Choosing to plant, cultivate or harvest based on both the phase of the moon and the astrological constellation the moon is passing through. One of the first sustainable agriculture movements, it treats soil fertility, plant growth and livestock care as equally interrelated tasks emphasizing spiritual perspectives. The whole farm is conceived of as an organism. Soil, plant, animal, human. Biodynamic farmers focus on the open pollination of seeds (with farmers thereby growing their own seed) and the development of locally adapted varieties. Biodynamic Farming has about 20% smaller yields than traditional organic farming but the flavors really stand out! Some think of it as Organic 2.0! Now, about those apples! 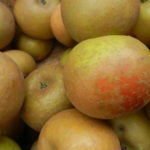 Ashmead’s Kernal and Roxbury Russet are funny looking apples. Their rough brown skin looks like that of a russet potato. They are juicy and tart and as they age and start to soften and wrinkle, their flavors intensify. Look for these to make an outstanding juice or applesauce! Belle De Boskoops are tart and fragrant. They are a great cooking apple as they tend to hold their shape. They also have four times the vitamin C as a Granny Smith! Kidds Orange Red is aromatic, sweet and sharp. Great for juicing, drying and eating out of hand. It is also one of the parents of the Gala apple. 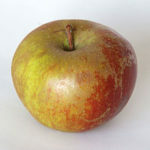 Red Gravenstein is a natural mutation of the Gravenstein apple. Extremly floral with a sweet/tart taste, this is one of my absolute favorite apples. 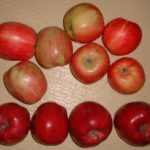 The Red Gravenstein is a little sweeter than the Gravenstein and is a great cooking apple. Try making a pie using half Red Gravenstein and half Belle De Boskoops! Pink Sparkle is a variety that is new to The Natural Grocery Company. Just under the skin, there are lovely pink polka dots in the flesh! Traditionally used in cooking, this apple purees well, so it would be great to make an applesauce or apple butter! Tart and slightly sweet, this apple looks like it was grown upside down with a broad base and narrows near the stem. Come in and taste a new kind of apple as we will be getting in more varieties every week! This really is a special time of year at The Natural Grocery Company. I don’t know of any other stores in the area that can come anywhere close to carrying this many varieties of local organic apples. Can you?